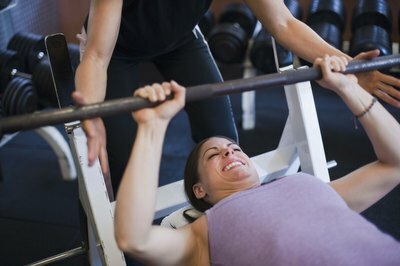 Bench press develops a woman's chest and shoulders. 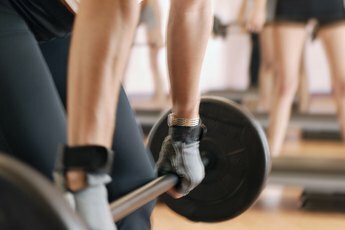 Although women typically possess lower levels of testosterone and growth hormone than men, they can still build significant muscle mass by participating in a high-volume weight-training program. A high-volume workout features a relatively higher number of exercises, sets and repetitions. The muscles must be exhausted and overloaded at the end of the workout, which then stimulates the muscle building process. You should complete each exercise at a volume of three to six sets of six to 12 repetitions each. During each exercise, use a weight that causes you to reach fatigue within six to 12 repetitions. If you're unable to complete six repetitions, choose a lighter weight. When you can complete 12 or more repetitions with ease, increase the weight. Women should develop all of the major muscle groups, including the chest, back, shoulders, biceps, triceps, glutes, quadriceps, hamstrings and calves. Many exercises that require recruitment of the chest also enlist assistance from the shoulders, and vice versa. Exercises that effectively develop the chest and shoulders include bench presses, dumbbell chest presses and pushups. For bench presses and dumbbell chest presses, lie on your back on a bench and hold the weight directly above your shoulders with extended arms. If you are using a barbell, position your hands on the bar slightly outside shoulder-width. Lower the weight down to your chest, then extend your arms to return the bar or dumbbells to the starting position. You should recruit a spotter when performing bench press and chest press to reduce the risk of injury from dropping the weights. When incorporating pushups, to place more emphasis on the shoulders, position your hands closer together so that they’re in line with your shoulders. Exercises that target the back include lat pulldown and rows. These exercises also require assistance from the biceps. To perform lat pulldown, sit at a pulley unit. Reach up and grab the bar with your hands placed wider than shoulder-width and palms facing away from you. Pull the bar down toward your clavicle, driving your elbows in toward your torso. Once the bar gets below chin level, extend your arms to return to starting position. For rows, grab a dumbbell with one hand. Kneel on a bench and lean forward, placing your free hand on the bench to stabilize yourself. With your back parallel to the floor, pull the dumbbell up to your torso, driving your elbow toward the ceiling. Extend your elbow to return the weight to the starting position. After completing the set, switch arms to work the other arm. For women looking to bulk up in size, targeting the smaller muscles with isolation exercises will enhance their results. To develop the biceps, perform barbell biceps curls and dumbbell biceps curls. During both exercises, keep your elbows against your torso as you bend them and bring the weights up toward your shoulders. Extend your elbows to return the weights to the starting position. For the triceps, perform lying dumbbell triceps extension and overhead triceps extension. For lying dumbbell triceps extensions, lie on your back on a bench and hold a single dumbbell with both hands above your chest with extended arms. Bend your elbows to lower the weight toward your forehead and then extend your elbows to return the weight to starting position. For overhead triceps extension, stand while holding a single dumbbell with both hands and arms extended over your head. Bend your elbows to lower the weight behind your head, then extend you arms to return to the starting position. To develop the glutes, quadriceps, hamstrings and calves, women can incorporate exercises such as squats, lunges and deadlifts. For squats, place a barbell on the back of your upper shoulders and position your feet at hip-width. Push your hips back and bend your knees to lower your body until your thighs are parallel with the floor, then extend back up to a standing position. To perform lunges, with a barbell on the back of your upper shoulders, take a large step forward with one foot and drop your back knee down toward the floor. Stop your knee just short of touching of the floor and bring your lead leg back to return to a standing position. Switch legs. For deadlifts, grip a barbell with your hands positioned slightly wider than your hips and allow it to hang down in front of you. Keep your back straight and head up as you bend forward at the waist, lowering the barbell down toward your feet. Once your back is parallel with the floor, extend back up to the standing position. 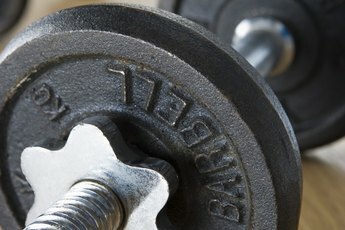 How Much Weight for Barbell Lunges?